View full sizeSteve Cowden/The Oregonian A proposal to build Oregon’s only privately financed and operated toll road, almost all of it crossing prime farmland south of Portland, is running into stiff opposition from local residents, farmers and elected officials. Backers of the Coastal Parkway — a proposed 11.77-mile four-lane highway linking Interstate 5 near Woodburn with Dayton in Yamhill County — have been meeting quietly since last fall with landowners and officials in potentially affected towns. But their apparent goal of building grass-roots support, one willing seller at a time, doesn’t seem to be working. Milne and fellow commissioners Sam Brentano and Janet Carlson are scheduled to meet with parkway promoters April 15, “just to hear first-hand where things stand,” she said. 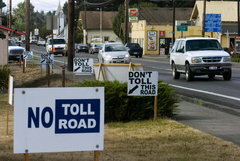 View full sizeBrent Wojahn/The Oregonian/2006When the idea of establishing toll roads came up in 2006 as a way to relieve traffic congestion in the Dundee area, the reaction from residents in the area was swift and clear. A new toll-road proposal also faces an uphill battle.Newberg businessman Robert Youngman, president of Royal Chinook Development Co., has, to date, been the parkway’s most visible public spokesman. He met with Donald-area farmers at a local cafe March 13 and has made recent presentations to city councils and planners in Dundee and Newberg. Similar talks are set for later in April with councilors in St. Paul and Donald. Reached at his Newberg office this week, Youngman declined to comment on a project that, if completed, would be only the third or fourth privately operated toll road west of the Mississippi River. Phil Martinson, a West Linn civil engineer who has attended many of the same meetings with Youngman, said it’s too early to say much about the project. “Hopefully, within a few weeks, I can give you something more,” he said. Youngman, according to meeting minutes, told Dundee City Council members in October that the Coastal Parkway’s financial backers want to proceed because they don’t believe the long-planned and publicly financed Newberg-Dundee Bypass will ever be built. 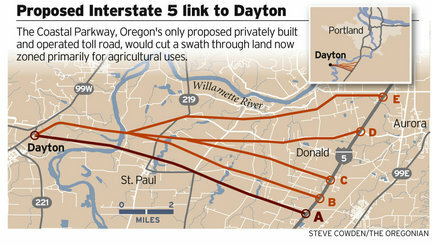 He tagged the Coastal Parkway’s estimated cost at $260 million and said the limited-access roadway’s preferred option would have only three interchanges — at Interstate 5, at Oregon 219 north of St. Paul and at Oregon 18 near Dayton. The route crosses prime farmland in the French Prairie area of northern Marion County. Without one or the other projects, he said, commercial and commuter traffic on Oregon 99W through Dundee will continue to remain hopelessly gridlocked. Asked to identify the Coastal Parkway’s financial supporters, Youngman listed Hampton Lumber, Evergreen Aviation, Cascade Steel Rolling Mills, the Oregon Trucking Associations and the Business Transportation Group. Steve Zika, Hampton Lumber’s CEO, said he wasn’t familiar with details of the Coastal Parkway proposal, but said any alternative to the current congestion jamming Yamhill County’s main highways would be welcome. None of the other groups cited by Youngman as backers immediately returned calls. Sterling Anderson, Marion County’s planning manager, said that even if sufficient funding is found, the Coastal Parkway will run into significant legal and regulatory obstacles. State requirements mandating that exclusive farmland remain in parcels of at least 80 acres, for instance, would have to be addressed, since a new road running through the middle of that land would create two parcels of 40 acres each, he said. In addition, the need to build a new bridge crossing the Willamette River, and perhaps the Yamhill River, would present huge hurdles for developers. State Transportation Department officials have sat in on several of Youngman’s presentations, but said it’s too early to assess the project’s chances of success. Local residents, meanwhile, say that French Prairie farmland is not for sale, certainly not for a new highway.